Wine dinners take place in many restaurants. They are events that bring people together for a meal and introduce people to new wines or present sought-after wines. In many instances, attendees are supporters of the restaurant yet unfamiliar with the winery. And a key element of the dinner is that the winemaker, winery owner or a key representative from the winery will attend to be on hand to share the story of the winery and discuss the wines. This person, along with the wines, becomes the focal point of the night. But another significant element is the menu that is created to pair with the wines. Since they opened three and a half years ago, Crossings Restaurant in South Pasadena has been hosting four to six wine dinners a year. 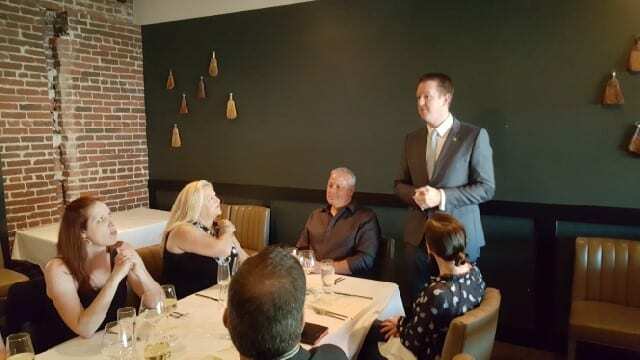 Owner Patrick Kirchen, who has been cultivating relationships with wineries since working as General Manager at Arroyo Steakhouse and Nick and Stefs, looks to share these relationships with the community. 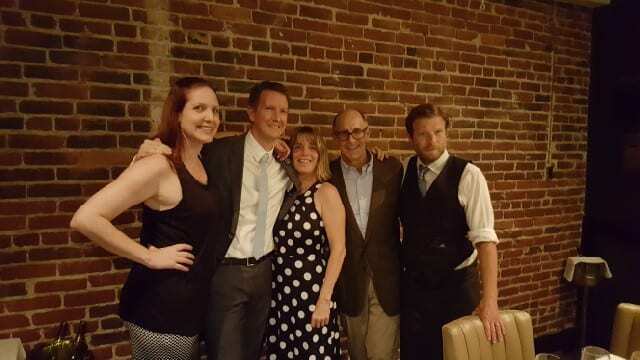 One of these relationships is with The Terraces, a winery based in Napa Valley and I was invited to attend the recent wine dinner they did at Crossings. To create the menu, Patrick sat down with Chef Lalo Sanchez and together they decided what to serve, working with different flavor profiles. Chef Lalo explained that wine dinners “take a lot of time and lots of planning to find what pairs with the wines…..but it is fun to play with different meats and produce.” The hard work pays off because the menu he created to pair with The Terraces wines was spot on. 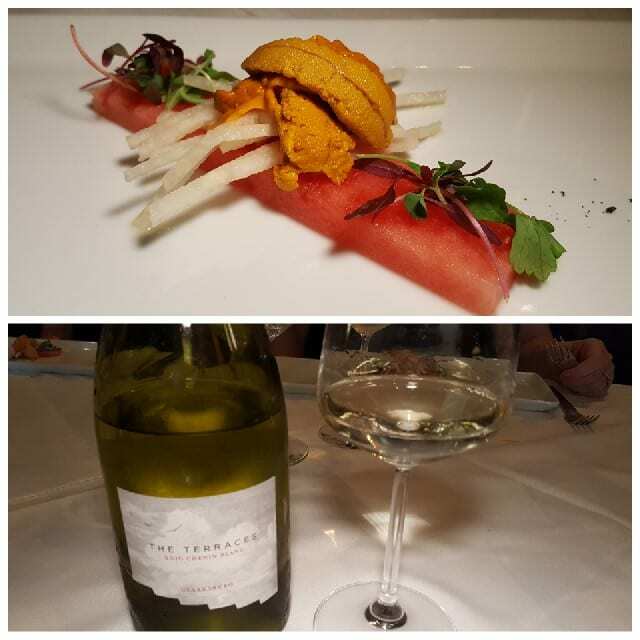 Uni, watermelon, jicama, ginger, yuzu and The Terraces Chenin Blanc, Clarksburg 2016 – We started with uni on watermelon with jicama, ginger and yuzu paired with chenin blanc. The crisp minerality, salinity and delicate acidity of the wine was harmonious with the fresh, sweet watermelon and the ocean brininess of the uni. Quail, savory waffle, chardonnay syrup and The Terraces Chardonnay Napa Valley 2015 – With our palate awake and ready to go, we were then served crispy fried quail on top of a savory waffle with chardonnay syrup and paired with chardonnay. The chardonnay, fermented in stainless steel with no malolactic fermentation and aged in neutral oak sur lies., has notes of pineapple and minerals with good acidity. 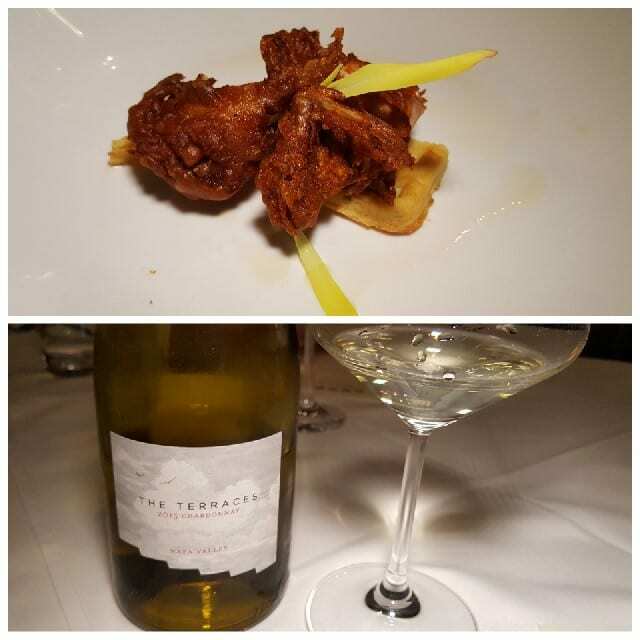 The wine had enough body and flavor to temper the spice of the quail while not getting overwhelmed by the sweet waffle. 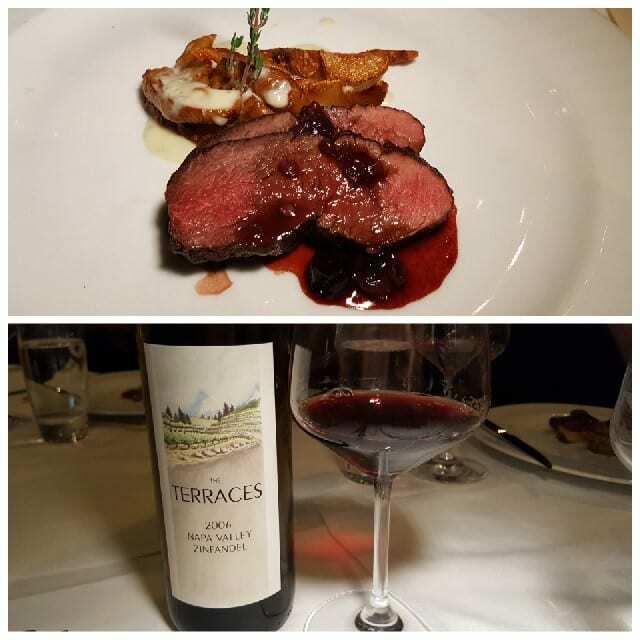 Ostrich, wild berries, sunchoke, blue cheese and The Terraces Zinfandel Napa Valley 2006 – The earthiness and spiciness of the 2006 zinfandel was a good match with the sweetness of the wild berries with the ostrich, fried sunchoke and blue cheese sauce. 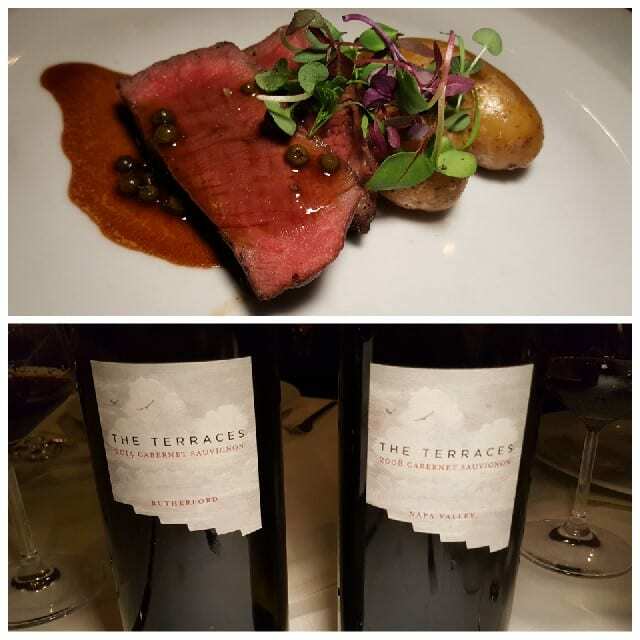 Beef Tenderloin with green peppercorn, bone marrow, fingerling potato with The Terraces Cabernet Sauvignon, Rutherford 2008 and 2014 – With the beef tenderloin we were able to taste both the 2008 and the 2014 cabernet sauvignon side-by-side. It is hard to believe that there was eight years between the two wines. The 2008 is still fresh and fruity, with aromas of red and black berries while the 2014 has slightly darker fruit aromas. Both wines paired with the beef tenderloin but if I had to choose one, I preferred the 2008. 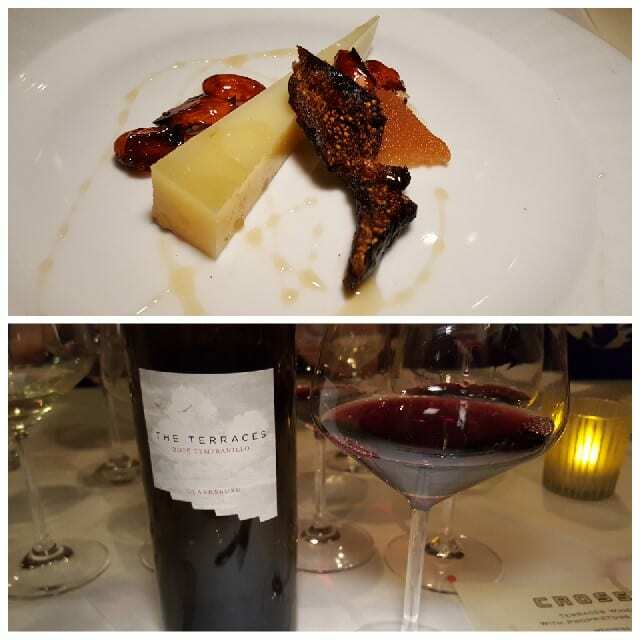 Cheese, local honey, almond with The Terraces Tempranillo, Clarksburg 2013 – The tempranillo, with aromas of bright red berries and vanilla, soft tannins and crisp acidity was an elegant pairing with the cheese with local honey and almond and a perfect end to the night. The wine dinner with The Terraces demonstrated that Crossings is where food, wine and service come together and I look forward to going back in the future for another wine dinner, or just to enjoy dinner in the main dining room. This entry was posted in Food, Wine and tagged Crossings, Crossings Restaurant, food, food and wine pairing, Patrick Kirchen, South Pasadena, The Terraces, Wine, wine dinner, wine pairing by Allison Levine.